While more than a few indie racers do exist, honestly, there aren’t that many truly great ones. Only ones that come to mind are Little Racers STREET and Nitronic Rush; the latter of which is not only 100% free, but also got a spiritual successor recently. After a quick glance, it seems Distance has taken everything that made its precursor great and… well, added to it! Time to hit the neon-bathed track once more. Now, before I get started, let me make something perfectly clear: Distance is currently in beta state, meaning that a lot can – and probably will – change between now and the fabled version 1.0. Chances are stuff will also be broken, the game is likely crash-prone, content’s missing, and so on. You should know the drill by now – Early Access ain’t exactly a new thing, just like public alphas/betas in general. That said, there is still fun to be had with the current build (beta 3297), and heck, the darn thing even has Steam Workshop support! Plenty of user-made content available already too, which is just plain awesome for early adopters. Game is playable after all, and it seems a lot are doing just that, based on the amount (120 at the time of writing) user reviews on its Steam page. Speaking of the game itself, anyone who’s played Nitronic Rush should feel right at home. 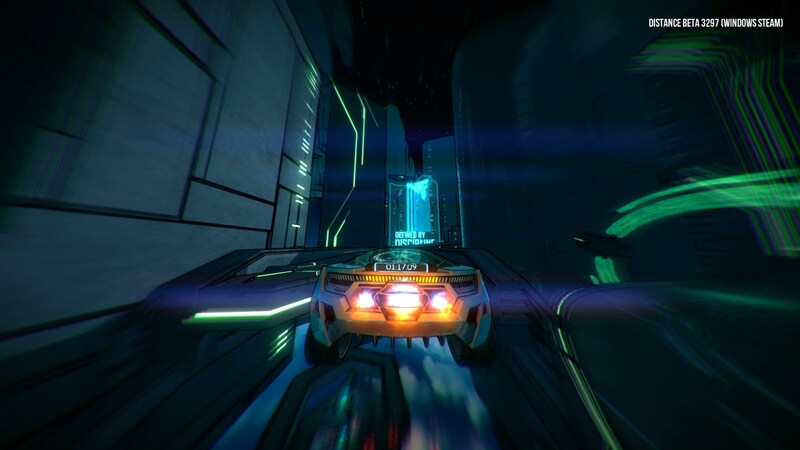 Although in case you’re not among them, here’s a quick what’s what (for now – I’ll be publishing a full impressions piece this weekend): Distance is, at its core, a survival racer. No, there aren’t any zombies, but you do have to go fast and think even faster, to avoid colliding with… well, just about anything, really. The roads are treacherous and unpredictable with obstacles around every corner. Instead of doing laps on a loop, you’ll be trying to survive to the end in the quickest time. Won’t be driving just any car either, as the lot are capable of crazy things like boosting, jumping (I kid you not), flying(!) and even rotating, to drive on walls. On walls! Needless to say, the tracks have been designed with such awesomeness in mind, meaning there’ll be gaps to cross, both the short kind, but also lengthy ones which involves taking flight, as well as particularly nasty obstacles to avoid. 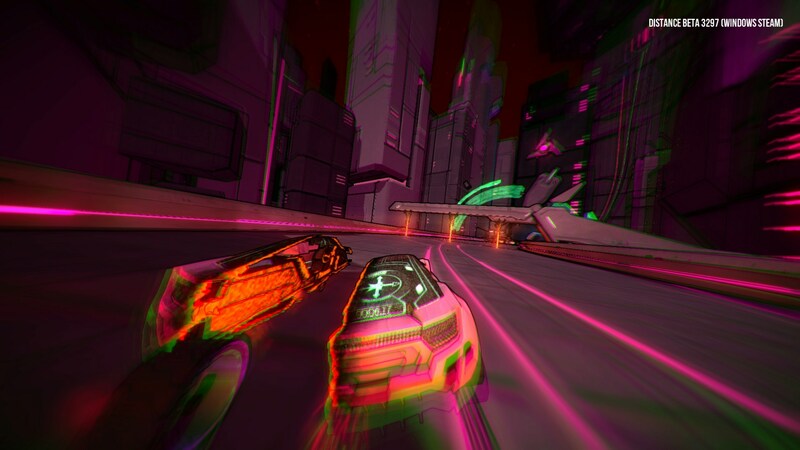 It may be a futuristic over-the-top arcade racer, but that doesn’t mean the vehicles are invincible. Almost quite the opposite, in fact, as you’ll definitely find out during the later stages. So what’s in the current version? Well, there’s an incomplete adventure mode (aka. campaign), several different ‘arcade’ modes, which can be played both online, solo and even in split-screen, and… lovely visuals. No really, look at the trailer below and you’ll see what I mean. Oh and from my brief testing session, I’d say it plays as great as it looks. But before you decide to hit the track, keep in mind that beta is very much beta. Distance [Early Access] is available for Windows, Mac, Linux, SteamOS from Steam, carrying a $19.99 $16.99 price tag until December 16th.